Why Isn’t the Pound Moving on Davis’s Resignation? (Bloomberg) -- For all this weekend’s extraordinary headlines and political turmoil over Britain’s exit from the European Union, the pound is barely budging. Just days after Theresa May thought she had secured support for the U.K.’s negotiating position, her plans, and a fledgling recovery in the pound, were thrown into disarray by the departure of key Brexit ministers. However, the move was relatively muted, even as May faces the prospect of losing her majority in parliament and the increased possibility of further resignations. The renewed political turmoil comes after the British currency fell for a second month in June against the euro. The pound fell 0.3 percent against the common currency as of 9:19 a.m. in London time, to 88.16 pence per euro, having risen as much as 0.4 percent earlier. Markets had cautiously welcomed May’s proposed “soft Brexit” strategy and were waiting to see how the European Union responded, according to Kotecha. “Against this background, markets will wait and see whether other key resignations follow,” he said. The departure of Brexit Secretary David Davis and other ministers, have the potential to throw the British government, which lost its majority in elections last year and has since ruled as a minority, into a fresh round of uncertainty, said Jacob Funk Kirkegaard, senior fellow at the Peterson Institute for International Economics, in an interview with Bloomberg Television. Negotiators from the European Union will offer her nothing knowing that May lacks a parliamentary majority, he added. 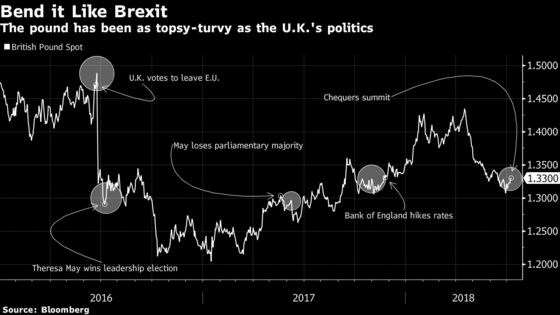 “Political risks continue to lend substantial uncertainty and downside risk” to the pound, even though activity data in the U.K. has improved, analysts from JPMorgan Chase & Co. had written in a research report Friday. The Bank of England “is likely to hike rates in August, but Brexit uncertainty and domestic politics remain tenuous,” the report said. The BOE’s rate-setting committee meets early next month, after three of its nine members, including chief economist Andrew Haldane voted to raise rates at the June meeting. The prime minister will have a crunch meeting with members of her Tory party to discuss her plan in Parliament on Monday evening. Some lawmakers have already expressed their misgivings. One slight problem for coup plotters hoping to unseat Theresa May however: Does anybody really want her job? “It’s the ultimate role where you’re damned no matter what you do,” said Kay Van-Petersen, global macro strategist at Saxo Capital Markets Pte Ltd in Singapore.